Much has changed in workplace and in workplace design over the last 40 years. The old workplace was a reflection of order and efficiency filled with impersonal cubicles and corner offices that reinforced hierarchies and discouraged socialization. But today’s workplace is personal, flexible, and collaborative – a result of cultural changes and technological advances that first played out in Silicon Valley. It started in the 70s with Hewlett-Packard, which adopted an open work environment to encourage interaction between engineers. In 2004, Facebook’s original headquarters utilized similar neighborhood design concepts like main streets, town centers, and food districts to define the workplace and reflect its youthful and unique culture. In short, Silicon Valley tech companies have changed the ways we work — and how we think about workplace design. As innovators, Silicon Valley tech companies were the first to adopt new, more casual attitudes about the workplace. They re-imagined how the workplace could function. For example, instead of being separated by specialization, workers were teamed together. Flexible work schedules and casual dress were embraced. 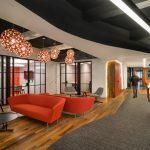 And with the advent of mobile technology and the subsequent rise of the 24/7 workplace, the function of the office was no longer to provide a space for employees just to work – it also was a place for workers to engage and collaborate with other employees. Citrix is one of the many tech companies that has embraced new ways of working. In doing so, it has changed workplace design. At one time, Citrix’s officewas a maze of cubicles and exterior offices. As a result, it was extremely quiet due to limited interaction between employees. 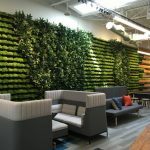 But they wanted to create more of a “buzz” around the office — and an environment that attracted employees and encouraged collaboration. So they set out to re-envision their office. They first observed that employees tended to interact around elevators and stair corridors. So they created lounges, coffee rooms, and meeting areas nearer the elevators and stairs, and employee interaction immediately increased. These social nodes were then replicated throughout Citrix’s open floor plan with much success. The larger and younger workforce at the turn of the 21st century has demanded operational transparency and more flexibility at work. So many Silicon Valley tech companies ditched private offices and cubicles for mobile desks that could be put together in any number of configurations — along with common social and meeting spaces within the office. From coffee bars to recreation areas, today’s Silicon Valley workplace is flexible. It’s also employee-focused and encourages spontaneous interactions as a means for generating greater innovation and productivity. For SAP Labs, “accidental collaboration” was a priority. They wanted a place where people could bump into one another in common areas, overhear one another, and leverage spontaneity. So they designed a customizable 10-person team room that contains movable dividing walls, then located each along the perimeter to maximize natural light and flexibility. The only element that stays with employees from project to project is their personal locked “mobile pedestal,” which simply rolls to the next team room when it’s time to move on to another project. This encourages movement – and spontaneous collaboration. Additionally, each “coffee corner” is collaboration-ready with drop-down projector screens and plenty of seating and writable surfaces. Realizing that there is also a need for down-time, SAP Labs implemented plenty of options for non-team time. Six-person study halls and acoustically sound phone rooms are located in the central areas, as well as Zen rooms that offer more casual meeting alternatives to the larger conference rooms. Silicon Valley culture and technology has radically changed the way in which architects and designers think about workplace design. Architects and designers once allocated 250 square feet per employee. Floor-plan design was limited by the realities of large, heavy computers and office equipment that stranded workers at their desks. Yet today’s dense workplace environments of 150 square feet or fewer per employee are designed around mobile technology efficiencies that allow smaller, more flexible, team-oriented spaces in any combination of private, semi-private and public spaces. Additionally, Silicon Valley’s creation of clean technologies like solar and wind has helped to advanced sustainable building practices across all industries. They’ve also been early adopters of daylighting, high-efficiency lighting, and energy efficient heating and cooling systems. Other companies have taken notice and are embracing Silicon Valley’s new workplace design and practices. One such example of Silicon Valley’s influence on workplace design is the office of Cassidy Turley BT Commercial Real Estate. Renovated in 2010 and constructed to qualify for LEED commercial interior classification, the office is not just sustainable but social. A kitchen and cafe create a central meeting space and casual break areas are located throughout. A light-filled office space, centrally located work surfaces, an open lobby, and glass-surrounded conference rooms create an open, vibrant workplace environment – one that’s transparent and designed for collaboration. And sustainability, while already adopted by many companies, will continue to lead workplace design by reducing energy costs, improving air quality, and limiting the workplace’s impact on the environment. Finally, as technology innovations and the workplaces of Silicon Valley evolve, they will continue to inform the ways and places in which we work. Previous articleBehind the Curtain: Kimley-Horn & Associates, Inc.
You can but its easier to get bitcoin by buying it. The same way it would not make Write My Assignment For Me – AoneAssignment much sense for you to dig for gold or diamonds at this point in time.